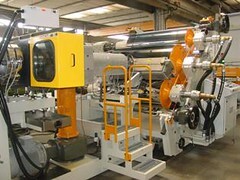 After intense testing, Italian PET extrusion line producer Union Officine Meccaniche says it has reached and exceeded an hourly output of 1250 kg/hour for its new line, with an energy consumption less than 0.30 kW/kg. The results, both in terms of production and in terms of energy savings, are the consequence of the non-stop R&D, says Union. This activity has allowed its newest single-screw extruder TR160 to achieve the targets it set. The plant, designed and tested with PET 100% post-consumer bottle flakes, is able to produce a sheet with a useful width of 1,200 mm and thickness from 0.3-1.2 mm, depending on the customer needs.